The fluidized-bed bioreactor (gas-solid) is a modified version of the conventional fluidized bed reactor used in chemical processes and other unit operations. 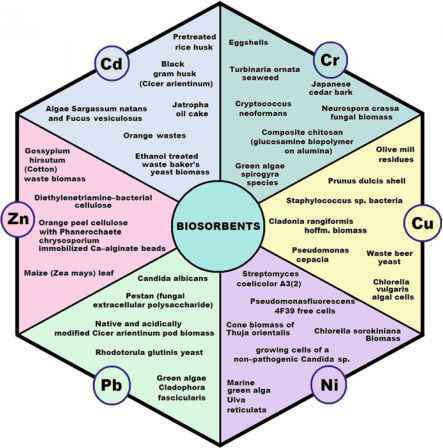 These reactors can be thought upon as an attempt to improve the existing design of other biological systems such as biofilters (Clarke et al. 2008). The schematic of a typical fluidized-bed bioreactor is shown in Fig. 3.11. The polluted air enters the reaction space with the help of a nozzle type distributor/ sparger placed near the tapering section of the bioreactor. These bioreactors are generally constructed as hollow cylinders with perforated distribution plates, placed just above the sparger. An important design consideration, for biofilm development, is the selection of an appropriate particle type to use in the bed, and that the particle can be easily fluidized. Clarke et al. (2008) enunciated that the fluidized state is influenced by the particle properties such as size, size distribution, density, shape, and moisture content. Besides, the fluidization state can also affect the mass and heat transfer characteristics, and the conversion, i.e., pollutant removal characteristics, in the bioreactor. Small particles in the size range of 0.15-0.3 mm can be used as the solid phase. Typical examples are; sand, carbon, fly ash, anthracite, glass, calcinated clay, etc. These fine particles can be easily fluidized by the upward flow of waste-gas entering the reactor. Poor fluidization behavior could lead to gas channeling and poor waste-gas treatment. In some cases, highly porous, fabricated media are also developed which allow biomass formation within the porous internal structure. efficiencies of ammonia in gas-phase varied from 0% to 40% for NH3 loads varying between 500 and 650 g NH3/m3.h. The low removal efficiencies were attributed to the unevenly formed sprouting resulting from high wall adhesion and aggregation of the particles caused by the mineral solution. Leslous et al. (2004) reported the performance of a fluidized bed bioreactor for gas-phase ethanol biotreatment. Their study used moist scrap wood particles, and >80% RE was reported for ethanol loading rates <1,150 g/m3.h. Clarke et al. (2007) used a gas-solid fluidized bed bioreactor for removing ethanol from polluted air, in a specially designed bioreactor packed with moist saw dust particles and glass spheres. The bioreactor, depending on the applied superficial gas-velocity, was designed to be operated in either packed or fluidized-mode. 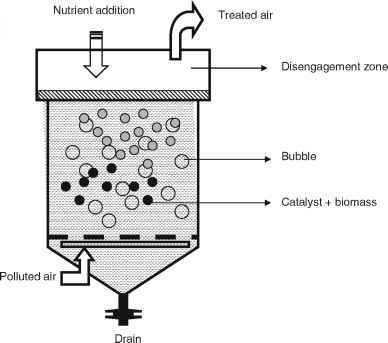 When the bioreactor was switched to fluidized mode, the sawdust and glass sphere mixture was maintained in a bubbling/slugging regime. The authors reported a maximum EC of 75 g/m. sawdust.h (during fluidized-bed mode) and 225 g/m3.h during the packed bed-mode. The high EC value achieved during packed bed mode of operation was then attributed to the ability of the packing material to withstand the hydrophilic high ethanol loads, subsequently leading to high biomass growth. The low EC value in the case of the fluidized-bed bioreactor was speculated to be due to the inability of the microbial cells to attach to the rigid saw dust particles during fluidization. Besides, as a performance improvement strategy for the fluid-ized-bed bioreactor, it has been suggested to recycle the non-treated air from the exit to the inlet, resulting in an increase in the concentration of ethanol to the bottom of the bed. Clarke et al. (2008) used peat granules (Sauter mean diameter of 680 mm) and inoculated the fluidized-bed bioreactor with Hansenula anomala, for the biotreatment of gas-phase ethanol. In this study, the authors reported maximum ethanol ECs ranging between 1,150 and 1,520 g/m3.h, when fluidized-bed bioreme-diation experiments were carried out at a superficial gas-velocity of 0.5, 0.75 and 1 m/s, respectively.